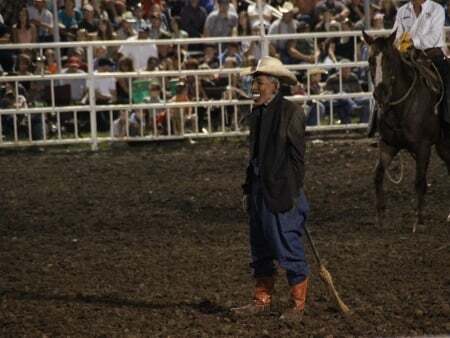 The Mesquite Rodeo in Texas is standing in public defiance of the recent controversy surrounding rodeo clown Tuffy Gessling in Missouri by featuring its own rodeo clown dressed in President Obama’s image. “Come see what is causing all the ruckus as the Mesquite Rodeo 2013 season closer gets a visit from a ‘special guest president,’” the rodeo announced Friday, according to the Dallas Observer. Mesquite Arena General Manager Steve Gander told Unfair Park that the rodeo is simply exercising free speech. “Presidential and celebrity clowns and dummies have been in rodeo and other sports and entertainment events since before Richard Nixon,” he said. Mr. Gander promises “good clean family entertainment.” Mr. Obama will also be joined at the event by three other presidents, the Dallas Observer reported. The management is actually handling this in a really clever way. The “Obama rodeo clown” will be the one people turn out to see, but the rodeo will have other clowns probably wearing Bush, Reagan and Carter masks, too. That will make anyone who complains look especially petty. So, kudos to the Mesquite Rodeo in Texas. If I lived there, I’d show up to watch the show. Hopefully, it will be packed and more rodeos across the country will stand up for free speech and Tuffy Gessling by putting more clowns in Obama masks.